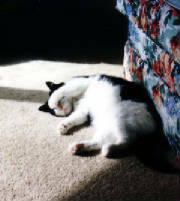 PJ was a used cat ("previously owned") who came to us with low milage, minimal tartar, and good fuel economy. There was no owner's manual, but she had an easy user-interface. She was low-maintenance and self-starting, and her body was in excellent condition. The original owner had christened her "PJ." which stood for something we'd rather just forget about. We changed it to "Plain Jane," but then changed it again to "Princess Jane" after we got to know her. The only "plain" that applied to her was that she was just plain user-friendly. She made a great lap ornament, shoulder wrap, and foot-warmer, and provided years of companionship (and entertainment). At approximately 14-16 years of age, she passed her 100,000 mile mark and was permanently retired in 2002. ...no owner's manual, but with an easy user interface.